Pujas for safe pregnancy and easy delivery. The prasadam from Divine Mother Garbarakshambigai Amman will protect the expecting mother and baby from all dangers. "Inspite of trying very hard and undergoing medical treatment I could not conceive even after r 7 years after marriage. I sent money to Janani and she offered puja and sent me the prasadam. I had the prasadam for 48 days while chanting slokams daily. 1 month after taking the prasadam I conceived naturally without any treatment." Thank you Janani for helping me get the Grace of Divine and Mighty Mother. In the first month of her pregnancy. my wife had some complications. 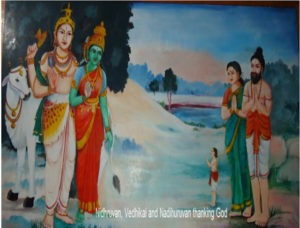 We prayed to the divine Mother Grabarakshambigai for help and offered puja through this website. There was a immediate change and things improved vastly. The rest of the course of the pregnancy was miraculously smooth and we had a normal delivery despite several complications. We are blessed with a lovely baby girl who has lit up our life. I’m happy to inform you that by the blessings of Goddess Garbharakshambigai we are blessed with a baby boy on 5th jan 2016. We’ve named our son ‘Saadhan Kowshik’, he was born in Swathi nakshatra, thulaa raashi. I wish to convey my heartful thanks to the temple in some way. Can you suggest me a way to make some contribution? I’m in Bangalore & can make online payment. Watch more videos about Grabarakshambgai Temple. Why should you offer prayers to Garbarakshambigai Amman? 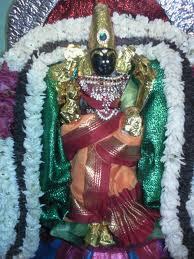 Garbarakshambigai Amman is the foremost fertility Goddess of India. She is renowned for her powers to bless couples with children and also safeguard pregnancies and ensure an easy delivery. In short, she has the powers to bless every aspect of childbearing. 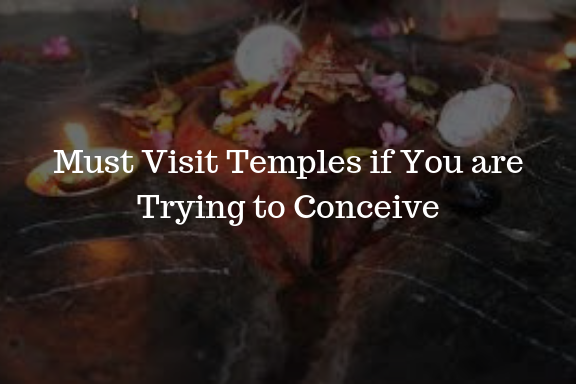 It is believed that childless people who worship here with devotion and faith are blessed with a pregnancy and pregnant women with safe deliveries. Unmarried women also pray here for their marriages. Special prayers are conducted by people on behalf of their pregnant relatives or friends. Unmarried women also pray here for their marriages. Special prayers are conducted by people on behalf of their pregnant relatives or friends. This temple is located in the fertile land of Thanjavur also known as the 'Rice Bowl of India'. 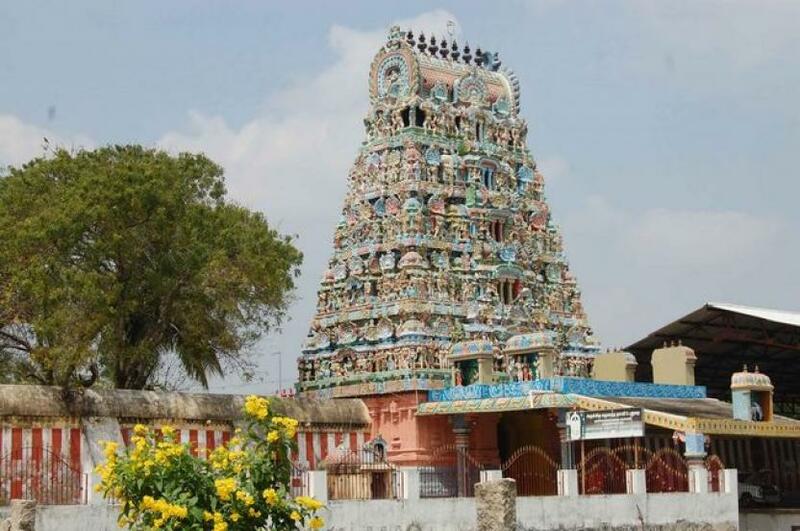 The exact location of the temple is in Papanasam taluk of Thanjavur district and it is 20 kilometres east of Thanjavur town and 20 kilometres South West of Kumbakonam. The nearest airport is Tiruchirapalli (Trichy) which is 85 km's away. From Tiruchirapalli, one can take a taxi to the temple. If one is planning to visit the temple only a day after reaching Tiruchirapalli then one can stay overnight at either Thanjavur or Kumbakonam before proceeding to the temple the next morning. There are excellent hotels that provide accommodation at both Kumbakonam and Thanjavur. The temple is about 25 km's from both Thanjavur and Kumbakonam and it takes about half hour to reach the temple. There are several means of transportation that can get you from Thanjavur/Kumbakonam to the temple that is in Thirukarukavur village Papanasam District. The nearest railway station is Papnasam at a distance of 6.5 km's. The railway stations of Thanjavur and Kumbakonam can be used as destination stations. The temple is about 25 km's from both Thanjavur and Kumbakonam and it takes about half hour to reach the temple. There are several means of transportation that can get you from Thanjavur/Kumbakonam to the temple that is in Thirukarukavur village Papanasam District. We have provided the Google map route route above. Thirukarukavur is situated in the following co-ordinates (10.86N, 79.27E). Smart Phone users may utilize this information. Apart from that various auto rickshaws and share autos are available from Papanasam Bus stop. Auto fare costs around Rs.60 to Rs.80 while share auto cost around Rs.5 to Rs.10. The temple functions from 5:30am - 12:30pm and then again from 4:00pm - 8:30pm. However many devotees do believe that offering pujas in the month of Margazhi is considered to be luckier for people who want to conceive. All necessary puja items are available just outside the temple. Facilities are available to offer Abishegam, placing children up to 5 years of age in the Golden Cradle, ear piercing, an offering of hair and Thulabaram. Abishegam is performed from Monday – Saturdays only in the mornings. There are no Abishegams in the evenings, on Sundays and other festival days. If you are planning to offer a saree then you should carry the saree with you. If you plan to offer Thulabaram it is better to contact the temple beforehand to check availability. If you are planning to offer a saree then you should carry the saree with you. If you plan to offer Thulabaram it is better to contact the temple beforehand to check availability. Men and women devotees are encouraged to wear traditional attire. However, men in shirts and trousers are permitted to enter the temple. Women devotees can wear either sarees or salwar kameez at the temple. During my visits, I have also noticed a few women devotees wearing jeans and other western attire. The temple management does not seem to have a problem with this. However, this can change with a change in the management. To be on the safer side it is best to go in an Indian attire. During my visits, I have also noticed a few women devotees wearing jeans and other western attire. The temple management does not seem to have a problem with this but this can change with a change in the management. To be on the safer side it is best to go in an Indian attire. Ample parking facilities available beside the temple. There are no big/good restaurants close by. You can eat the Annadanam at the temple or carry your own food. The temple Annadanam is tasty and is highly recommended. Accommodation will be available at Kumbakonam or Thanjavur only. There maybe small small lodges close by but no hotels. Fuel: Make sure you have sufficient fuel when visiting this temple. No petrol stations close by. Petrol can be found at Papanasam about 6 kms away. Abishegams are offered in the morning hours at the temple every day of the week except Sundays and other festival days. The abishegams are offered at 8:00 am. There are no evening abishegams. If you are interested in offering an abishegam you will have to be present in the temple half an hour prior to the abishegam time. With prior intimation to the temple, it is possible for you to tonsure your baby’s hair at the temple. It is also possible to avail the services of a goldsmith and have the baby’s ears pierced. Adorning the Goddess with sandalwood enhances Her beauty and leaves the visiting devotees spellbound. If you would like to witness this spectacle then you should visit the temple on Friday evenings when Amman is covered with sandalwood paste and Her supreme beauty is further enhanced. If you would like to offer this service you can do so paying the charges of Rs.5000 at the temple. The cost is Rs.5000 for both Indian and overseas devotees and you are requested to contact the Temple office for the date of booking. 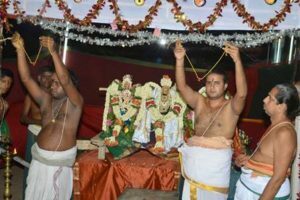 As is the custom in other major South Indian temple devotees, in Garbarakshambigai Temple too devotees can offer Thulabaram. The devotees will have to sit on one side of the weighing scale and their offerings (ghee, oil, food, grains, currency, gold, silver etc.) can be placed on the other side equaling their body weight. 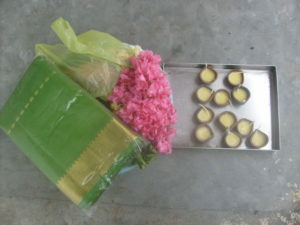 These offering will then be used by the temple administration. Surplus materials donated in Thulabaaram are being sold to devotees during Sundays at subsidized rates under auction. Thousands of devotees who visit the temple are blessed by Amman. When their prayers are answered and they like to express their gratitude. 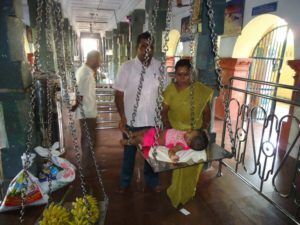 Most couples visit the temple after the birth of their child; as a way of expressing their gratitude and also obtaining blessings for the child they can place the child in a Tanga Thottil and go around the Garbarakshabigai Amman Praharam. Children up to 5 years of age can be placed in the Thanga Thottil. The charges for placing the child in the thottil is Rs.550/- and this can be paid at the office. This service can be availed in the morning and during the evenings. The Thanga Thottil is not really made of gold but it does have a silver covering. Devotees are encouraged to express their gratitude by returning with the child and placing the child in the Thanga Thottil. 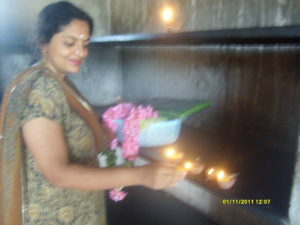 In this temple, people who pray for pregnancy, are advised to light up eleven lamps (one for Sri. Vinayagar, one for the Lord Mullaivananathar and nine for Almighty Sri. Garbarakshambigai) and who pray for safe delivery are advised to light 5 lamps (one for Sri. Vinayagar, one for the Lord Mullaivananathar and three for Almighty Sri. 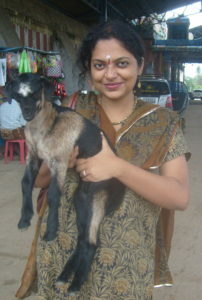 Garbarakshambigai). Annadanam is one of the highest offerings according to Hindu philosophy. It is one of the best ways of expressing your gratitude to the divine. The temple is situated in a small village where there are no big restaurants. 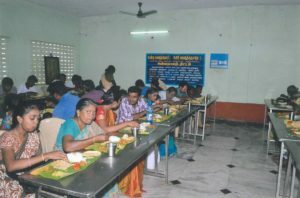 The Temple offers Annadanam to 100 devotees on a daily basis. If you are visiting the Temple then do part-take of the meal as it is a superior form of prasadam. The ghee prasadam has to be taken by the couple who are trying to conceive. When you visit the temple for ghee prasadam the procedure to obtain it is simple and straightforward. You will first have to procure the puja items and the ghee prasadam. Once this is done you can go directly and have darshan of Lord Mulaivananathar. After offering pujas at the Shiva Sannidhi you can then move on to the Amman sannidhi. Once you have finished the archanai, the priest will instruct you to smear some ghee on the steps of the sannidhi. The ghee prasadam that you got will be placed at the feet of Amman and returned to you at the end of the puja. The couples can then go outside and buy ghee lamps at the counter and light 11 lamps as an offering to Ambal. If the couple feels like the can offer other additional offerings at the temple like Annadanam, Thulabaram, Tonsuring of hair etc. Once the couple returns home they will have to take the prasadam for a period of 48 days. There are instructions from the temple on how the couples must take the prasadam. If a couple cannot visit the temple personally it is ok to get the prasadam through other people. In the period of these 48 days, it is good if the couple can recite the Garbarakshambigai mantras. If time permits the mantras can be chanted 108 times after morning or evening puja. If there is insufficient time then please chant as many times as is possible for you. You can listen to and download the audio songs of Garbarakshambigai Amman. Please note that there are no other rules for chanting mantra. Please chant as you would chant any other mantra/sloka in the presence of Amman’s photo or keeping Amman’s thoughts in your mind. You can order the ghee prasadam online here. The oil prasadam has to be used by pregnant women who want safe pregnancy and easy delivery. When you visit the temple for oil prasadam the procedure to obtain it is simple and straightforward. You will first have to procure the puja items and the oil prasadam. The prasadam is a small bottle of castor oil. You will first have to procure the puja items and the oil prasadam. The prasadam is a small bottle of castor oil. The puja items are available just outside the temple and the oil prasadam is available inside the temple at the counter near the administrative office. Once this is done you can go directly and have darshan of Lord Mulaivananathar. After offering pujas at the Shiva Sannidhi you can then move on to the Amman Sannidhi. You must then go outside and buy ghee lamps at the counter and light 5 lamps as an offering to Ambal. The prasadam is usually obtained in the 3rd trimester of pregnancy. If the woman cannot travel during that time then she can obtain the prasadam through other people. There are no food restrictions while taking the prasadam. The woman can continue taking nonvegetarian food. The complete list of instructions for using oil prasadam is mentioned at the temple. During the period of the pregnancy, it is good if the women can recite the Garbarakshambigai mantras. If time permits the mantras can be chanted 108 times after morning or evening puja. If there is insufficient time then please chant as many times as is possible for you. You can listen to and download the audio songs of Garbarakshambigai Amman. These audio shlokas and songs are very powerful with excellent vibrations for your unborn child. You can order the oil prasadam online here. This punugu satta is offered to devotees as prasadam for health conditions; particularly skin diseases, cardiac problems and other surgical conditions. 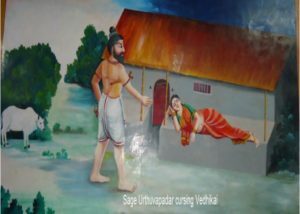 It has to be noted that the punugu satam is not always offered to Lord Mulaivanathar. It is offered on the 11th day after the new moon. This day is also called the Valarpirai Pradosham. Once devotees obtain the punugu sattam they can apply small quantities on the affected parts of their bodies after taking a bath and offering puja at home. Imagine a scene thousands of years ago, a time when rishi's and muni's populated India and miracles abounded. 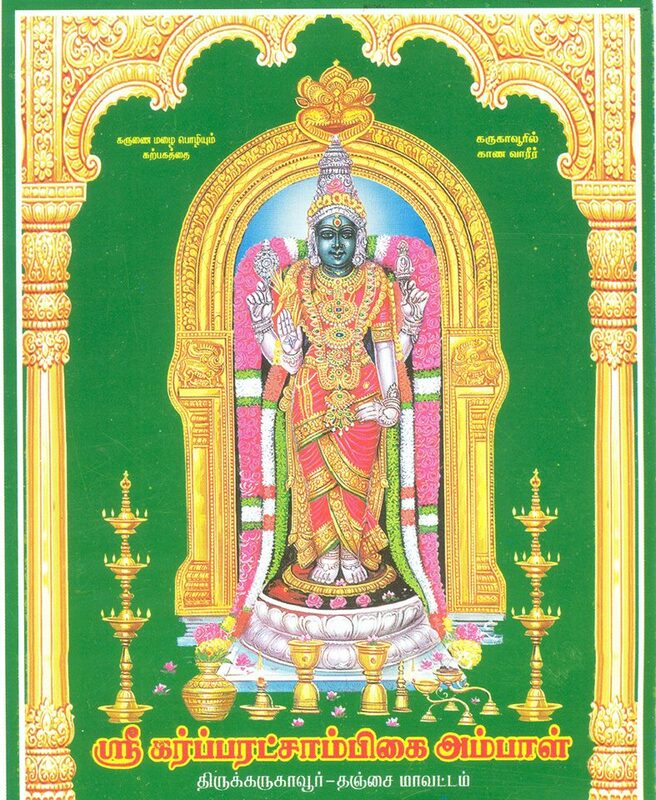 Lord Mulaivanathar grants the boon of good health. People suffering from skin diseases and other incurable conditions offer prayers here and take the punugu sattam prasadam to get relief from their sufferings. Goddess Parvati took the form of Garbarakshambigai Amman to grant a boon to all childless devotees who wanted the blessings of having children. Garba means Womb; Raksha means to Protect and Ambigai means Parvati. Garbharakshambika means “The Mother Who Protects the Womb”. Thousands of childless devotees throng this temple every day to pray for the blessings of conceiving children and pregnant women come here to pray for a safe pregnancy and easy delivery. A majestic and magnificent form of Shakti, Goddess Garbharakshambika is responsible for granting the boon of motherhood to childless women, protecting women with uterus related disorders, and protecting the unborn babies of pregnant women. Thousands of devotees across all regions, sects and religions visit the temple everyday to pay homage to Her. Who should offer prayers at the Garbarakshambigai Amman? Who should offer prayers to Lord Mulaivananathar? The uniform experience of the people of these parts bears unfailing testimony to the powers of the deities of this Temple. The inhabitants of the village vouch for the fact, that within living memory, there has been no case of fatality to the mother or child during confinement. Pregnant women from elsewhere come here and pray to the God and Goddess for a safe childbirth. No one in this place has ever had a miscarriage or pregnancy problem. It is at a place like this that one can understand what "Divine Presence" is. For over a thousand years Saints like Appar, Sundarar and Campantar have recited the glories of this Amman as early as the 7th century in the 12 volume Saiva canonical works. Other literary works like the Periya Puranam by Sezhkizhar also mention the glory of this temple and the Amman here. Goddess Garbarakshambika’s idol is the supreme personality of Motherhood and this is represented by the magnificent 7 feet tall idol. This idol stands in the sanctum sanctorum (Garba Graha) of Her temple. This beautiful idol is adorned with kanjeevaram sarees and exquisite jewellery. She is decked with abundant fragrant and colourful flowers which add to Her beauty. The Goddess has the most radiant smile on Her face depicting positivity and a ray of hope. Lord Shiva is mainly worshipped in the form of a Shiva Linga. In the Shiva lingam, one can see even today the impression of jasmine creepers which once covered the Shiva lingam. The place has been a forest with jasmine garden once upon a time. Hence the Shiva at this place is called as Mullaivana Nathar (Lord of the Jasmine Garden). 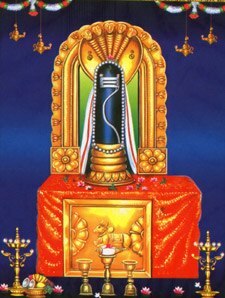 The Shiva Lingam of the presiding deity, Lord Mullaivana Nathar in the main sanctum of this temple is a Swayambu (self-manifested ) Lingam, it is one out of the 64 in the world. The Lingam of Lord Mullaivana Nathar is made up of ant hill mud. Therefore there is no water abhisekam for this Lord. Instead, the Lingam is merely smeared with a kind of musk called “Punugu” in Tamil. The temple has a peaceful atmosphere and has not really changed much over the last 200 years. You can see the photograph from the early 1800's and compare it to the photo taken in 2013 and see that the architecture remains more or less the same. Temple gardens that contribute to the peaceful atmosphere. The Shri Garbharakshambika Sameta Shri Mullaivana Nathar temple is spread over a wide expanse with huge towering Gopurams and a beautiful water tank in front of it. 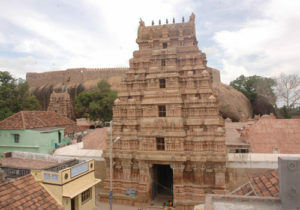 There is a main Raja gopuram on the east and the temple has also got an entrance on the south side. The temple is surrounded by tall coconut palms, the whole atmosphere is very calming and serene and lends the place sanctity. Once you walk past the temple tank, you reach into the temple complex of Shri Garbharakshambika Sameta Shri Mullaivana Nathar. Both the shrines of Lord Mullaivana Nathar and Goddess Garbharakshambika are situated in the outer Prakaram, which is the main Prakaram facing the east direction. The main sanctum of this temple has the Shiva lingam and Goddess Garbharakshambika is situated to the left of the Shiva temple. It is believed that the Nandi at this temple is in Swayambhu vigraham (Self-manifested) and so is the Karpaga Vinayagar inside the temple and as such commands unique devotion from the worshippers. There is also a shrine for Lord Subramanian. The devotees first visit the shrine of Lord Mulaivananathar and then the shrine of Devi Garbarakshambigai. The Gopuram and the huge compound walls tell the story of more than a thousand years. The Sthalapuranas which are in Sanskrit and Tamil are preserved in manuscript forms and show the antiquity of the temple. 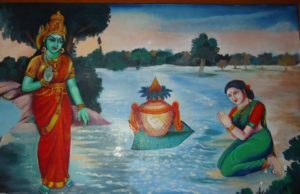 The Sthalapurana gives a detailed account of the origin of this Kshetram and the various persons who obtained Divine Grace at this place. There are also ancient inscriptions on the walls inside. Inscriptions from King Raja Raja Chola’s period who ruled between 985 and 1014 AD; as well as those from Parantaka Chola’s period (early 10th century AD) are seen inside the temple. There is evidence that Beema, Garkiyar, Gouthamar and a lot of ancient kings worshiped the God in this temple. Appar, Sundarar and Sambandar, the three famous Nayan-mars (Saints) have celebrated the glory of the God and this temple in soul-stirring verses (pathigams) of rare beauty and charm. 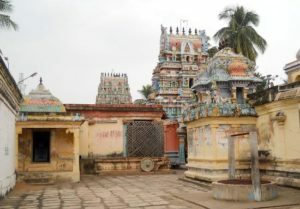 The three Nayanmars visited these temples along with their followers in spite of the inconveniences they faced while travelling the nook and corner of Tamilnadu in search of these temples. There are instances when God Shiva himself had directed them and shown the way to some of the temples so that the above Nayanmars could visit these temples and compose Pathigams. These Pathigaams composed in the classical Tamil language are of immense value to Tamil literature. 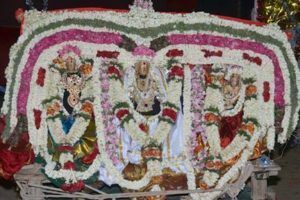 What are the festivals celebrated at Garbaratchambigai Temple? Vaikasi Brahmotsavams: Vaikasi Brahmotsavam is celebrated with great pomp and show at the temple. Several hundred people participate in the processions that are taken out during this festival. Navratri: During the Purattasi month the 10 day Navarathri festival commences and is celebrated. Margazhi utsavam: Margazhi festival is celebrated at all temples in Tamil Nadu and India. Mainly the celebrations of this festival take place in all Vishnu temples and Shiva temples. Another importance of margazhi is that devotees read Tamil Holy Scriptures “Thiruppavai” and “Thiruvempavai” during this month. Thiru Kalyanam: The traditional wedding ceremony of Garbarakshambigai Amman to Lord Shiva. Thirukkarthigai: Tamil Nadu celebrates Karthigai Deepam as the traditional festival. This festival of lights involves lighting lights almost anywhere to put an end to darkness. People believe that the light will make people close with Lord Shiva on Karthigai Deepam. Lord Shiva will shed all his blessings during this special time of the year.